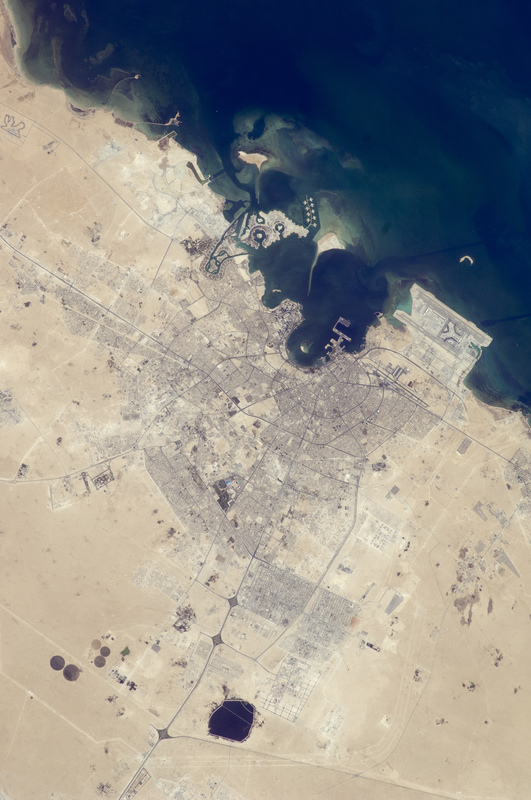 The old and new zones of Doha, the capital city of Qatar, are clearly visible from the International Space Station. The old city comprises the ancient bazaar, or Souq, near the dhow harbor, which is still used today for traditional Arab sailing vessels. Modern port facilities have sprung up to the east of the Souq. Subsequent developments have sprouted progressively further from the ancient center, with ring roads concentrically arranged around it. The diplomatic quarter is reached via the waterfront Corniche promenade, north of the old city. 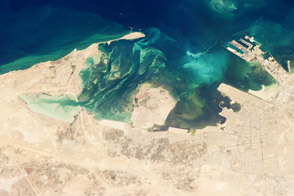 Further away, an extensive marina known as West Bay Lagoon, with boating access to the Persian Gulf, stands out (image top). Qatar’s new artificial island, known as the Pearl-Qatar, is under construction with 32 kilometers of new coastline just offshore of West Bay Lagoon. This development is intended mainly as a residential zone, with themes based on Arabic, Mediterranean, and European cultures. The Pearl-Qatar is so named because it is being built on one of Qatar’s historical pearl diving sites. A string of small islands built along the outer margin is intended to recall the pearl-diving culture of the nation’s past. When compared to maps of the proposed project, the basic outline of the islands appears to be substantially complete. The distance from the entry causeway to the end of the string of small islands is 5 kilometers in a straight line. 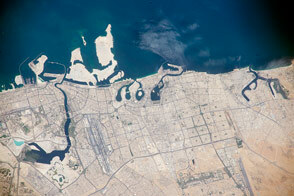 This image also shows the network of deep access channels—marked by darker blue water—leading to The Pearl-Qatar and West Bay Lagoon. The population of Qatar is almost 1.7 million, with nearly 75 percent being migrant workers from south and southeast Asia. Ninety percent of Qatari citizens live in Doha. Qatar enjoys vast hydrocarbon wealth, thanks to the third largest gas reserves in the world. Consequently, the emirate has one of the highest per capita gross domestic products (GDP) in the world. Qataris are known to be cricket, tennis, and soccer enthusiasts. On December 2, 2010, Qatar won the bid to host the 2022 FIFA World Cup. An underground soccer (football) stadium is being built, the first of its kind. 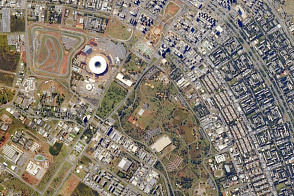 The existing sports complex is based at the Khalifa Stadium, visible to the southwest of the city. Astronaut photograph ISS025-E-6121 was acquired on October 5, 2010, with a Nikon D2Xs digital camera using an 180 mm lens, and is provided by the ISS Crew Earth Observations experiment and Image Science & Analysis Laboratory, Johnson Space Center. 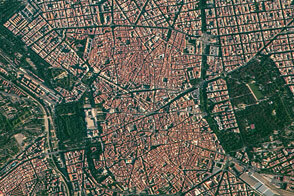 The image was taken by the Expedition 25 crew. The image has been cropped and enhanced to improve contrast. Lens artifacts have been removed. The International Space Station Program supports the laboratory as part of the ISS National Lab to help astronauts take pictures of Earth that will be of the greatest value to scientists and the public, and to make those images freely available on the Internet. Additional images taken by astronauts and cosmonauts can be viewed at the NASA/JSC Gateway to Astronaut Photography of Earth. Caption by M. Justin Wilkinson, NASA-JSC. 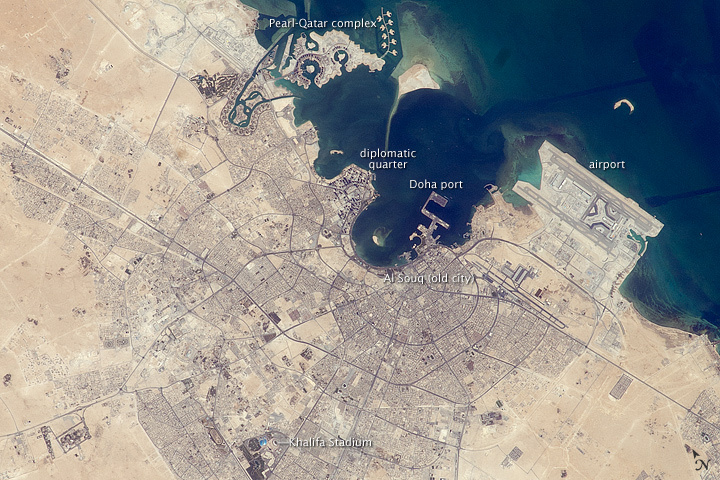 The old and new zones of Doha, capital city of Qatar, are clearly visible from space, as is the Persian Gulf emirate’s new artificial island, The Pearl.